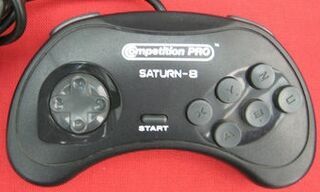 The Saturn-8 is a third-party control pad for the Sega Saturn. It is a simple pad which is functionally identical to the official Saturn control pad, though likely retailed for slightly cheaper upon release. The Saturn-8 is presumed to have been created by Honey Bee, although was distributed under various different labels including Competition Pro in the United Kingdom and Nyko in North America (as the Strike Pad). Sega OziSoft re-branded it and officially distributed it in Australia.